“Make Web, Not War” aka Can’t We Just Get Along? Joey provides the details the upcoming ‘Make Web, Not War” event in Toronto and Vancouver. 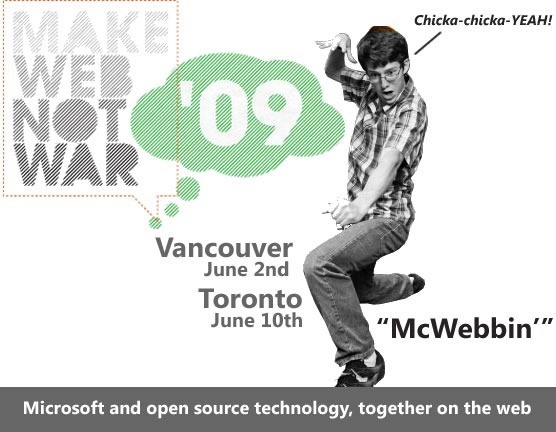 Make Web, Not War is happening today in Vancouver (June 2, 2009) and next week in Toronto on June 10, 2009. (Let’s not start about disaster that is the web presence, frames, Flashturbation, no deep linking, etc.). Microsoft released the Web Platform Installer, WebPI for short, version 2 includes IIS7, SQL Server, Visual Web Developer, ASP.NET and PHP. That’s right, PHP and the ability to install popular PHP and .NET open-source applications including WordPress, Drupal and more. Here’s my take, it’s great to see Microsoft embrace web technologies. The web is a mash of technologies from operating systems to application servers to database servers to web servers to development frameworks to AJaX frameworks to CSS frameworks. It’s all about choice. You can mix and match the pieces that make the most sense for you at a moment in time. And now that choice, flexibility and power come to web developers that run Windows operating systems. Not everyone has the flexibility of choosing each of the layers. When I worked at Rye High, I built applications initial in ColdFusion 6 and Oracle 8i because it was what was available. The addition of FastCGI and PHP to IIS opens the available tools to many developers and IT professionals that run Windows in their corporate environments. The WebPI makes it drop-dead simple to install PHP and Drupal or MediaWiki. Pick the right tool for the users, the tasks, your infrastructure and support. Make informed decisions. Are there limitations? Definitely, part of the fun is playing in the boundaries and pushing as close to the edge as possible. The event is about focusing on the task at hand. Let’s make a better web. Let’s solve problems. By helping developers gain access to the applications and platforms they want is important. Microsoft is starting to understand, again, the power of an ecosystem. Rather than fighting to convert PHP developers to ASP.NET, you can see the empire embrace and enable the tools that are a part of the web. Further evidence of this acceptance of PHP as a language and a tool of the web can be seen PHP SDK for Windows Azure. The addition of Java in the Azure world. I’ll be talking about the web, open platforms, innovation and karma at the Toronto event on Wednesday, June 10th at the Ted Rogers School of Management (use the entrance at 55 Dundas Street W.) and runs from 8:30 a.m. to 5:00 p.m.. The Toronto event will feature breakfast, keynote, web partner community showcase, another keynote, lunch, breakout sessions, a Windows Server 2008 InstallFest, a web developer technical session and the FTW! competition final showdown. It’s be a very full day. The registration fee for both the Vancouver and Toronto events is “donate what you want”, with a suggested donation of CAD$10. The money will go to a good cause: PREVnet.ca, the anti-bullying network. Posted on June 2, 2009 Categories Events, TorontoTags Microsoft, php, Toronto, webnotwar, webpi5 Comments on “Make Web, Not War” aka Can’t We Just Get Along? markET is looking for a Web Developer. To qualify you must be passionate about technology, exude curiosity and code at blinding speeds. You enjoy challenge and seek to grow into more senior roles over time. Your initial contract will be to develop our new website. Subsequent contracts, leading to full-time employment, will be the development and renovation of our customer’s websites. You will also become the company’s IT resource and be exposed to the latest tools and techniques associated with the automating of marketing and sales; such as Reputation Management, Demand Generation, Customer Relationship Management (Sales force automation), Search Engine Optimization and Search Engine Marketing. Using a supplied design and marketing brief, design the web technology architecture for our own website, and then code, test and publish the site. Working from a design brief, renovate our client’s existing websites or code, test and publish new ones. You will also learn the technical aspects of the various online marketing and sales tools we use as part of our service, and then offer technical support to our internal users and clients. A minimum of 3 years experience developing web applications. Additional skills in SEO, Java, .NET, PHP and SQL are nice-to-haves. Please submit an application in writing and an on-line portfolio.